Shahnaz Akmali’s attempts at finding answers about the death of his son Mostafa Karimbeigi in the political protests of 2010 has earned her one year in jail, ban from political activity, travelling abroad and membership in social media. An informed source has told the International Campaign for Human Rights in Iran that the 26th Branch of Tehran’s Revolutionary Court has slapped Akmali with the prison and ban sentence for her efforts to find the truth about the death of his son. The sentence is reportedly issued by a preliminary court and is based on the charge of “propaganda against the state”. Akmali’s association with Mourning Mothers and Mothers of Laleh Park, two groups founded by mothers of activist killed in Iranian prisons and those killed in the peaceful street protests that followed the controversial 2009 presidential elections in Iran, have been accepted as evidence in proof of her guilt. In addition communicating with the media regarding her son’ s death as well the death of other activists in addition to communicating with and supporting families of political prisoners have also been held against her in court. Akmali was arrested last February and later released on bail. In July it was reported that Shahnaz Akmali’s daughter was receiving threats of having her house burnt down if her family did not cease communicating with the media. 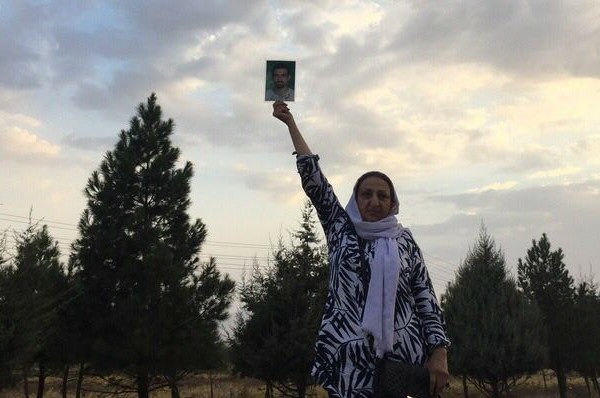 The Revolutionary Court has issued its recent sentence maintaining that Akmali’s persistence in contacting the media regarding her activities to find the perpetrators of his son’s death reveals that she has not been rehabilitated. Shahnaz Akmali’s son Mostafa Karimbeigi, 52, was shot and killed in the street protests of December 2009 against election fraud. Her demand for answers regarding his son’s death during peaceful protests, led to her arrest last January. She was held in Evin Prison for three weeks without access to counsel and conditionally released on a 100 million touman bail. The peaceful protests against election fraud that followed the victory of Mahmoud Ahmadinejad in 2009 was confronted by severe violence from Islamic Republic authorities with scores killed and thousands arrested and slapped with heavy prison terms. Demands for accountability from the government regarding the violent treatment of protesters has been put down with repeated arrests. The Karimbeigi family were not allowed to bury their son in Tehran and could only lay their son to rest in a secluded rural area. The establishment continues to prevent any form of assembly in fear of igniting the election protests they systematically put down after the 2009 presidential elections. Shahnaz Akmali persisted in holding a remembrance vigil for his son connecting with mothers of other perished protesters and dissidents. These gatherings have also become a source of support for families of political prisoners.